Investigating the way human rights are reflected in media can help us to understand our rights in modern society, according to a new book by a City journalism academic. Professor Howard Tumber says until now there has not been any attempt to bring together the varied research on the topic. 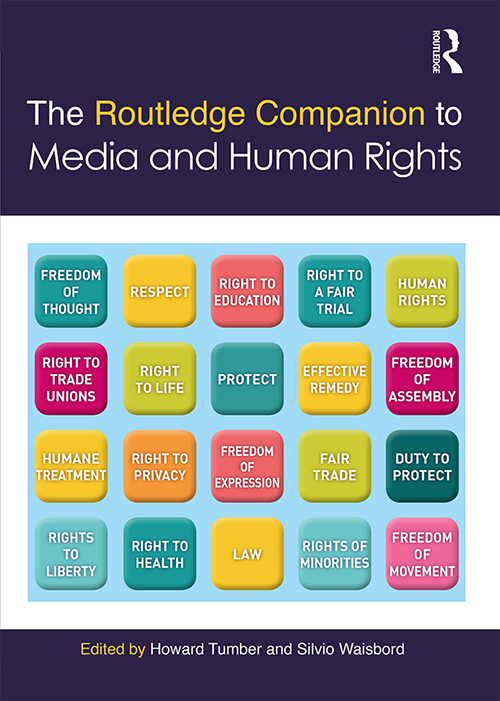 The book, The Routledge Companion to Media and Human Rights, comprises 49 chapters on themes such as human rights in the digital age and the role media have in freedom of expression. It includes an article by Professor Tumber and his co-editor Silvio Waisbord about how the growth of media research reflects ongoing movements to broaden academic perspectives of human rights beyond legal studies. He said: “We have long been interested in various aspects of the relationship between the media and human rights – for example, the intersection among journalism, conflict and war, and the definition of expression and communication rights in contemporary democracies. “Our belief is that media studies has continued to make important contributions to the study of human rights. The book is the first collection to bring together two distinct ways of thinking about human rights and media, including scholarship that examines media as a human right alongside that which looks at media coverage of human rights issues. It includes two chapters by other City journalism academics: Investigative journalism and human rights by Professor Michael Bromley, and Rights and responsibilities when using user-generated content to report crisis events by Dr Glenda Cooper. City PhD graduate Judith Townend also wrote the chapter Freedom of expression and the chilling effect.